Get The Mythos Guide to New England from RPGNow. You too can earn money from writing articles by signing up for InfoBarrel. The Mythos Society Guide to New England by Clint Staples is a role playing game supplement published by Skirmisher Publishing. It is a generic supplement, although it is a resource aimed at the Call of Cthulhu game, specifically at the states of New England, where H. P. Lovecraft set many of his stories. The supplement is available in black and white PDF and standard black and perfect bound softcover, or as a bundle of the two. It isn't available in hardcover, nor is it available in the premium print option, which uses slightly better quality paper than the standard one. The softcover is available through RPGNow's print on demand service. There are 145 pages in the PDF, 142 numbered pages in the softcover. The PDF page count includes the full colour front and back covers and a full colour advert for other products, the latter of which is missing from the print on demand version. Of the 142 numbered pages, there are four pages of front matter and a table of contents and a fifth page for the Selected Bibliography. The cost is $6.99 for the PDF alone, $13.95 for the softcover black and white book or $13.95 for both the PDF and the printed book. Credit: Bradley K. McDevitt/Skirmisher Publishing/eGDC LtdThe Introduction gives an overview of the book and introduces Cotton Mather's Black Book, with the first page of it and two related pages by a Mythos scholar in Arkham. Chapter 1, Land and Landscape of New England, covers the geography of New England, on the whole and on a state-by-state basis, and the weather of the region. The second chapter, New England Between the Wars, gives an overview of changes during the period, including populations of the New England states, and also has a timeline from 1919 to 1938, briefly covering a variety of local, national and international events. Chapter 3, Prehistory of New England, is one of the more interesting chapters in the book. The information in this section is described as being internally consistent - material from various different sources is related to each other, something that would not originally have been done, given some of the sources. Some of the material provided would not actually have been known in the 1920s. There are section on the Red Paint People, Empire of Woden-Lithi and Abbe Brasseur de Bourbourg, and notes on how to use the supplied information in a campaign. In addition, there is material on pre-Columbian contact with the New World, with a Celtic conquest and a second Celtic invasions, near east seafarers and the missing land of Norombega, which was seen on early maps of the region. Chapter 4, Native Americans of New England, is about the Algonquian tribes of the region,. giving an overview of the religion, habits and myths, as well as more in-depth details on the ten tribes, and what happened to them after the area was colonised. Monsters of the Lands and Seas of New England is the fifth chapter and provides details of various monsters, sea and land, that are reputed to have been seen, some with witness accounts. Chapter 6, Witches, Wizards, and Weather-Makers of New England, covers the Salem Witch Trials, witchcraft in general (as appropriate to the setting) and various reputed witches and wizards by name and in more detail. The final chapter, Mysteries of the Diverse States of New England, has a couple of pages on events affecting the whole region, then goes through state-by-state listing various occurrences, people, mysterious events and sites in each state. The delivery costs were $5.32 by Royal Mail Second Class. The supplement was ordered on a Saturday and was delivered, by Royal Mail Second Class, on the following Thursday. Despite the speed with which it arrived, this is actually the slowest delivery to date, probably because it wasn't despatched until late Tuesday. Still, given that the book wasn't printed until it was ordered, and that it wasn't a working day, six days from order to receipt is impressive and there certainly was no real need to pay extra for Royal Mail First Class. One thing that isn't clear from the site, or from looking at the PDF, and which made the layout of said PDF look a bit odd, is that this is a smaller sized book than is typical for most supplements. The layout of the supplement, like many Skirmisher supplements, is adequate but not exceptional, as they don't concentrate on making their supplements look that pretty. It is, however, functional enough and one problem with the PDF relates to the book size. The research done on this book, also like many of Skirmisher's other supplements, is quite extensive, as can be seen from the Selected Bibliography at the end of the supplement. Credit: Skirmisher Publishing/eGDC LtdThe book's layout does look a lot better than it does in PDF form, due to it being a small softcover, only 5.5"x8.5". When viewing as a PDF something that has been laid out as a small book it doesn't look as good. One consequence of the small size is that there is rather less content than might be expected from the number of pages, due to the pages being smaller. Unfortunately, the size of the softcover isn't stated anywhere, so anyone expecting a supplement in the larger, more common, sizes is going to be disappointed. The Contents in the printed book is just about adequate; it covers the major sections but not any of the sub-sections, apart from in Chapter 7, which would have been helpful, and there is no index. The PDF bookmarks are the same. The PDF does have the advantage of various internal links pointing to other parts of the supplement, which is helpful. The indexing of the book could, on the whole, have been better. The images in the book are all in black and white and presumably public domain, as they are in general quite old. They are primarily photographs but there are also some older maps of the areas covered. Although the Mythos Guide is aimed at Call of Cthulhu, it lacks any game "crunch" at all and is therefore suitable for any game system without having to convert any stats. The lack of specific Call of Cthulhu stats is probably due to the requirement of having a license granted in order to use them. The period aimed at is definitely the 1920s, but the various historical events and mysteries covered are going to be the same in any era after which they happened, so much of the supplement is suitable for other periods. There is a lot of potentially useful background information, although it will require some effort on the part of the Keeper to make use of it. There is also bonus content available to complement the book on the d-Infinity site. The emphasis is on things that are described as having "historical plausibility" and "historical weirdness" rather than historical accuracy. For example, the theories in Barry Fells' referenced amateur archaeology books about proto-Germanic and Celtic empires in the New World, which have largely been rejected by the mainstream community, do provide some interesting possibilities for those playing in the Cthulhu Mythos. 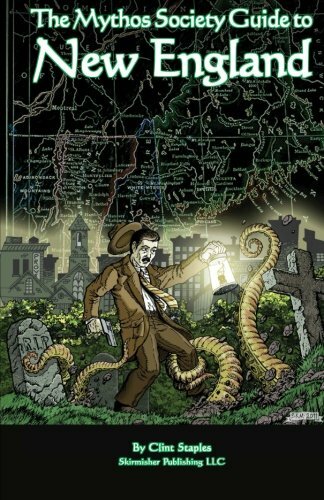 It does, however, cover actual locations in New England, rather than the fictional creations of H. P. Lovecraft, such as Arkham and Kingsport. Scattered throughout the supplement are extracts from the fictional Black Book, which could be assumed to be a Mythos tome, attributed to the historically real personage of Cotton Mather, a supporter of the Salem Witch Trials. These add colour, but a few more of them would have been appreciated, but they are likely not the easiest thing to come up with. Using the information in the Mythos Guide will, as mentioned, take a bit of work, but The Mythos Society Guide to New England is well worth getting and reading, even if it is lacking in game "crunch," as the extensive background information for the region is well suited for adding depth to any campaign set there.